The new Insignia Sports Tourer is lighter because Opel/Vauxhall used more lightweight materials, such as aluminum for the hood. Opel/Vauxhall has borrowed heavily from its 2013 Monza concept to design the station wagon version of the new Insignia, the company said. The General Motors subsidiary released the first pictures of Insignia Sports Tourer on Monday ahead of the midsize wagon's debut at next month's Geneva auto show, where it will share the stage with the model line's Grand Sport hatchback, which went on sale in January. The wagon will go on sale in March. A distinctive chrome strip dubbed the "Opel blade" runs along the roofline into the rear lights, taking inspiration from the fastback Monza concept that first appeared at the Frankfurt auto show four years ago. Opel says the feature makes the car look more athletic, while the standard chrome roof rails give it a more premium look. 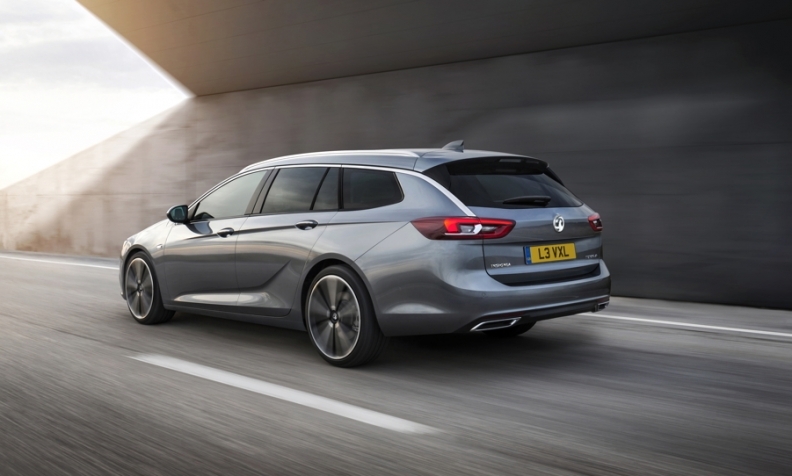 The Insignia Sports Tourer weighs up to 200kg less than the car it replaces because of Opel/Vauxhall’s use of more lightweight materials, such as aluminum for the hood, automaker said in statement. The car is built on GM's second-generation Epsilon, or E2, platform. At 4986mm, the Insignia Sports Tourer is more than 80mm longer than its predecessor model. It also is longer than the wagon versions of the Mercedes-Benz E class, Audi A6 and Skoda Superb. The trunk length has grown by 97mm compare with the old model to increase space by 100 liters with the rear seats down to 1,640 liters. No figures were given with the seats up. Opel has said the new Insignia range will be the most high-tech in its class. Equipment available will include a head-up display, semi-autonomous lane keeping assist, an automatic pop-up hood to aid pedestrian protection and the latest generation of Opel's IntelliLink infotainment system that can be further enhanced by adding a wifi hotspot, which is an option. Technology available in the wagon version will include a hands-free electric tailgate-opening system. The Insignia range will offer a new 165-hp 1.5-liter turbocharged gasoline unit derived from GM's small gasoline engine range. It will also offer 1.6- and 2.0-liter diesels as well as a higher-powered gasoline engine. A crossover-inspired version of the wagon called the Country Tourer will also be launched at some point in the future, Opel has said. That version will make use of the optional all-wheel-drive functionality of the new platform, which also includes an optional active torque vectoring system that alters the amount of torque going to either rear wheel to improve driving dynamics.